Sure, Wolf Blitzer may have forgotten his co-anchor’s name, but CNN still managed to come in first place in the 25-54 demo for Super Tuesday, the network touts. According to Nielsen fast national data, CNN topped Fox News and MSNBC in the demo adults 25-54 during last night’s coverage of Super Tuesday, registering the largest cable news primary or caucuses night on record in primetime among adults 25-54. CNN also grew compared to 2008 Super Tuesday and beat two broadcast networks at 10pm (ABC and CBS). During primetime (8-11pm), CNN ranked #1 with 1.598 million, Fox News followed with 1.364 million and MSNBC lagged far behind with 625k among adults 25-54. 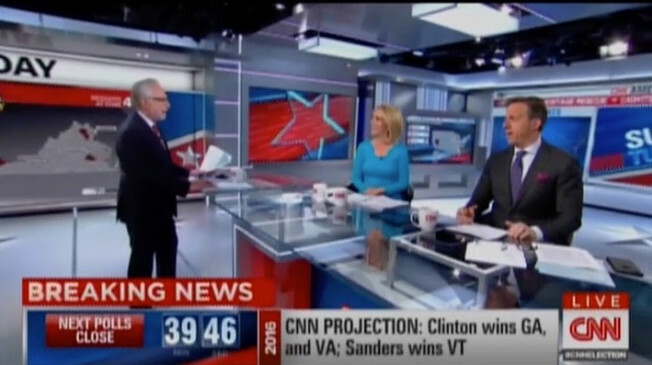 In total viewers, CNN averaged 4.100 million, +107% more than MSNBC’s 1.982 million. Fox News registered 4.883 million. CNN grew compared to Super Tuesday in 2008, increasing +12% in total viewers (4.100m vs. 2008’s 3.646m) and was up + 5% among adults 25-54 (1.598 million vs. 2008’s 1.526 million). MSNBC is way down compared to 2008, losing -39% of its adults 25-54 audience (625k vs. 2008’s 1.029 million) and was off -6% in total viewers. At 10pm, CNN averaged 1.565 million beating both ABC’s 1.141 million, and CBS’ 1.377 million among adults 25-54. In total viewers, CNN outperformed ABC News (3.849m vs. ABC’s 3.125m). In younger viewers (18-34), CNN averaged 515k, CBS had 316k and ABC trailed with 239k at 10pm. During the live coverage block (7p-2a), CNN was also #1 in the demo, averaging 1.146 million, +17% more than Fox News’ 976k and +144% more than MSNBC’s 470k. In total viewers, CNN had 2.902 million, MSNBC followed with 1.553 million and Fox News posted 3.416 million. Yet Fox News still come first in total number of viewers.